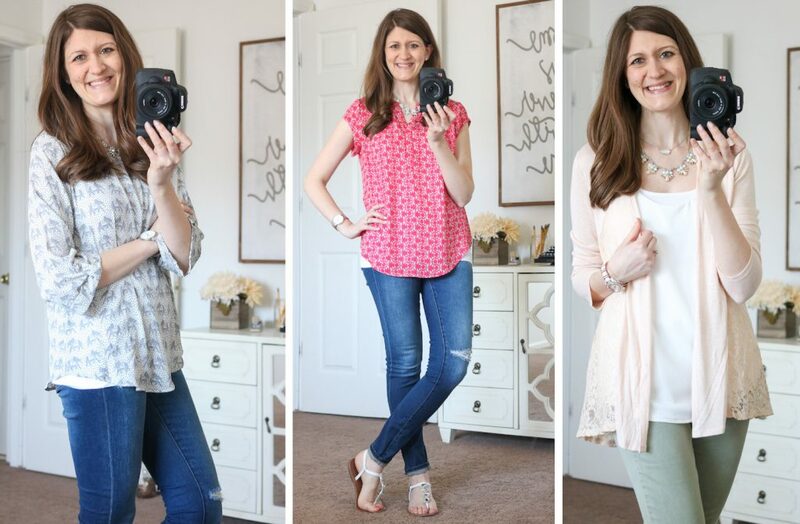 My May Stitch Fix review is finally here! It's no secret that my usual stylist, Layla, is completely amazing and in very high demand. So this month, I decided to change things up a little. I reached out to Stitch Fix and requested a stylist other than Layla with similar taste. This is how much I love you! Stitch Fix graciously obliged and my stylist this month was Leslie. If you've been searching for a new stylist, and you like the my fix this month, you might want to request Leslie to style your next fix. 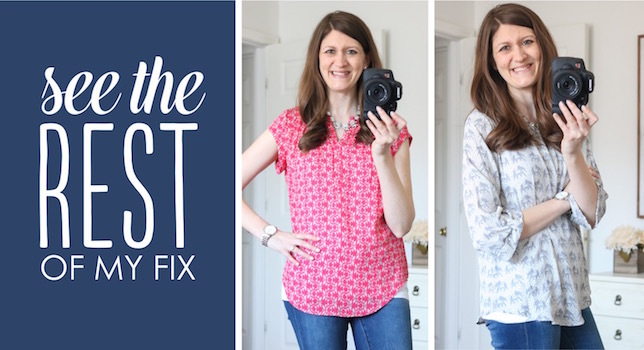 I also had a little bit of extra fun and shared a video that I created while I opened my May Stitch Fix box and got my first look at the clothes inside. If you missed the video, you might want to start by watching it in yesterday's blog post. This post contains affiliate links. We receive a small commission each time someone makes a purchase through one of our links, which helps to support the blog. Now that you're all caught up, let's dive into this month's fix! 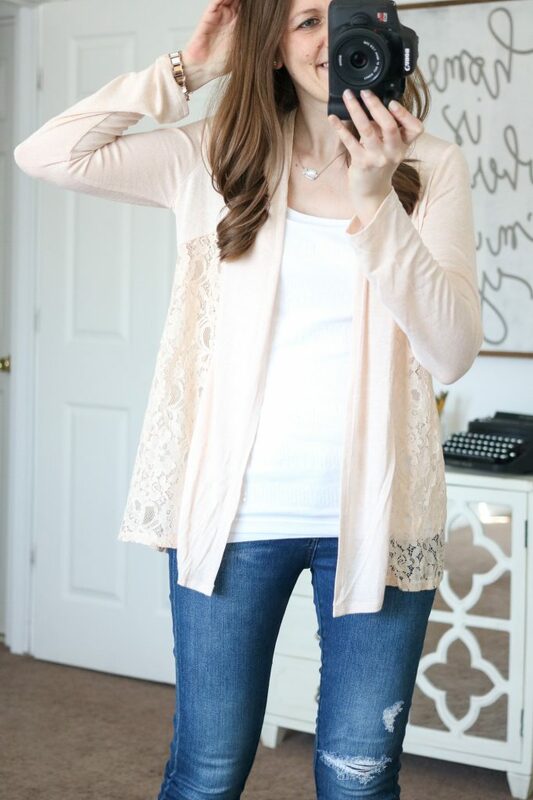 As soon as I saw the peach Mal Lace Inset Cardigan from Market & Spruce ($58), I just had to try it on. When it comes to my personal style, I can tell you that it doesn't get much better than a washed out pastel with lace detail. I kept things very clean, simple, and casual when I styled the cardigan. I kept the palette very neutral for this outfit. I layered an old sequin white tank top from Old Navy with a solid white tank underneath. (I never wear just one shirt … ever.) One tank was is always a little too see-thru for my taste, and I find that I am much more comfortable layering two tank tops together, even if they are both the exact same white tank top. The jeans are new. 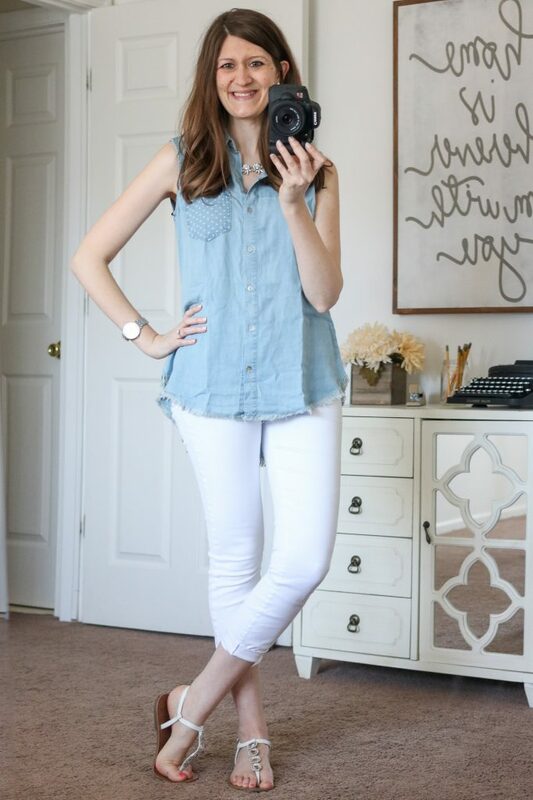 They're BlankNYC jeans from Nordstrom and they are a perfect fit. Stretchy, comfortable, lightly distressed and they don't sag. The shoes are an inexpensive pair of t-straps I picked up last year. I also kept the jewelry soft and neutral to compliment the outfit. I can't express how much I love my white and rose gold watch (similar here), my rose gold Gorjana shimmer bar bracelet and Kendra Scott Cami mother of pearl necklace. They were a perfect fit to the soft palette and truly brought the whole look together. I knew instantly that the Mal Lace Inset Cardigan was definitely a keeper. I just had one issue with the fit that wasn't completely on-point with my style. The sleeves were a little bit looser than I typically like. It was almost as though the sleeves were slightly baggy on me. I wasn't a big deal, but I like my long-sleeve cardigans to be a little more tailored and fitted; otherwise this style of top ends up looking a little shabby on me. I tried to capture a photo of the extra fabric in the sleeves, but this was the best I could do. The look was easily controlled by pushing my sleeves up to 3/4 length, which is precisely how I intend to wear this cardigan every single time. The second item in my fix was a white Aliyah Sleeveless Shell Blouse from 41Hawthorn ($48). Shell blouses are pretty much made to go under blazers and cardigans, so I kept on the Mal Lace Inset Cardigan and changed into the olive green Patrick Cropped Chino Pant from Level 99 from my 21st fix to dress up the look a bit. What had been an effortlessly casual weekend look was instantly transformed into an effortlessly just-dressy-enough-to-be-comfortable-and-still-be-work-appropriate look. (Which, by the way, is my favorite kind of look). The shell blouse was notably more dressy than the fitted sequin tank I wore when I first tried on the cardigan. I also added the Jolie Necklace from Perry Street that I recently received in my Rocksbox. 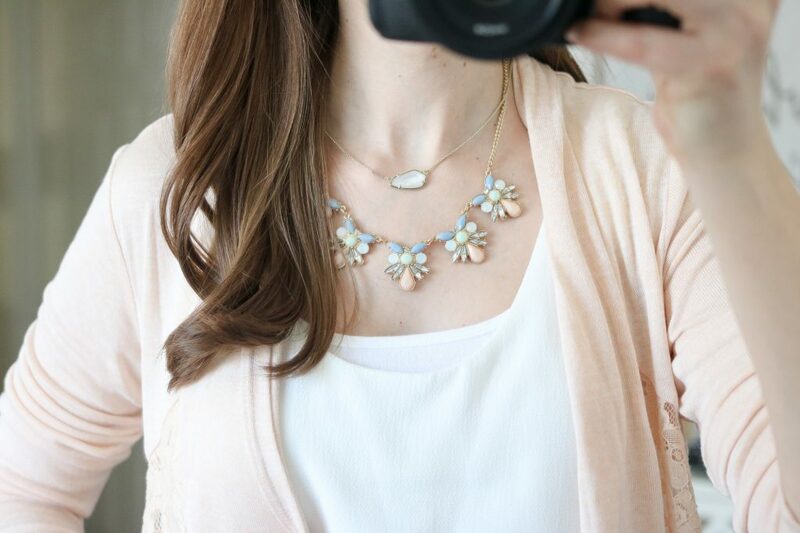 I have searched all over the internet to share a link with you because I adore this necklace, but I'm pretty sure it's only available through Rocksbox. If you're not interested in Rocksbox, but you're looking for a similar necklace, I found a few options online that may strike your fancy. The ensemble was gorgeous and I loved how flowy the shell blouse made the outfit look; much more sophisticated than when I just wore a couple tank tops. But there was one thing I did not like. The shell was huge on me. The neck hole and armpit holes looked like the blouse was made for a much larger person (which is surprising since the blouse was a size small). I could hide it under the cardigan pretty well, but summer is coming and I need to be able to remove an outer layer without feeling self-conscious. That and the fact that $48 is a little too much to pay for a plain blouse that fits poorly. This item will be returned, but I am now on the hunt for a flowy white sleeveless blouse that I can comfortably wear under that lovely lace cardigan. Next up was the Vitoria Split Back Top from Liverpool ($54). Not a scrap of chambray exists in my closet and this is a problem I have been seeking to remedy for quite some time – which is why I was overjoyed to find that Leslie sent a chambray item my way. She must have been studying my style board on Pinterest and honed in on all of the times I begged for something in lightweight denim. At first glance, this particular chambray item looked like it wasn't quite my style. The bottom edge of the top had an unraveled look that I wasn't quite jiving with, so I tried to dress it up with a pair of white skinny capris, a crystal statement necklace and the white jeweled sandals from my wedding. This top had a few things going for it that I really did appreciate. The appropriate-sized armholes were a quite a refreshing change from most sleeveless tops. The top of the blouse was cut perfectly for my proportions. At the end of the day, this top still wasn't my favorite item and I just couldn't get past the raw denim along the bottom. It just wasn't quite my style, so it was going back to Stitch Fix. Leslie also sent a few lovely blouses my way. 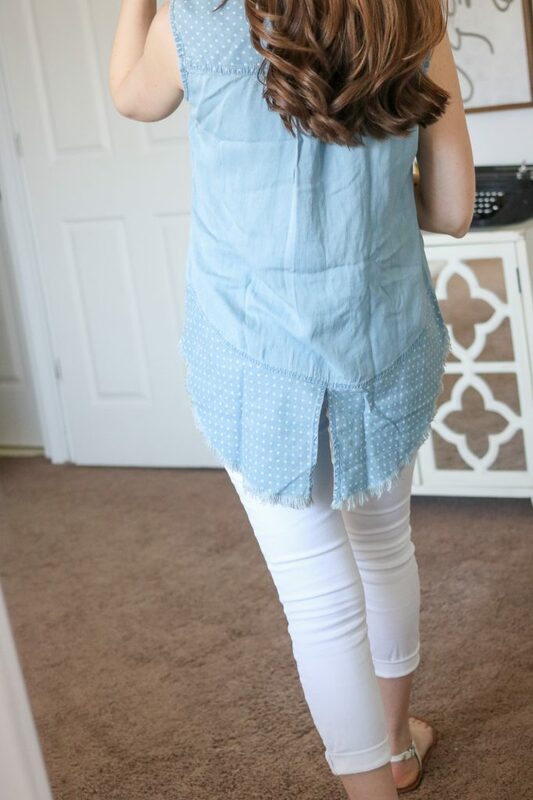 You can see the rest of my May Stitch Fix Review on the second page of this post. Make sure you scroll all the way to the bottom because I'm also giving away a $50 Stitch Fix gift card and fashion bloggers from all over the internet are sharing some of their recent Stitch Fix styles in my monthly link up. Click the image below to read the rest of the post. See you there! I watched your unboxing video yesterday and really enjoyed it. I had a feeling that the cardigan would be what you kept and I was right. It’s kind of disappointing when every item isn’t a winner but the budget appreciates that. My budget is VERY glad that I only kept one item. I’m so glad you enjoyed the video! 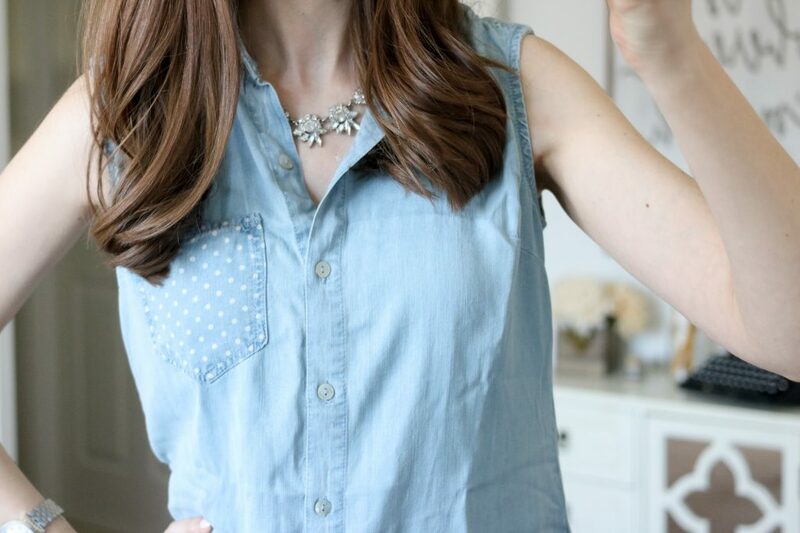 I totally agree with you about the chambray top. Not your style. BUT think about how cute it and patriotic you’d look with some red shorts for a 4th of July BBQ! I love the cardi! It looks awesome styled with your destructed jeans. Thanks for hosting another link up! 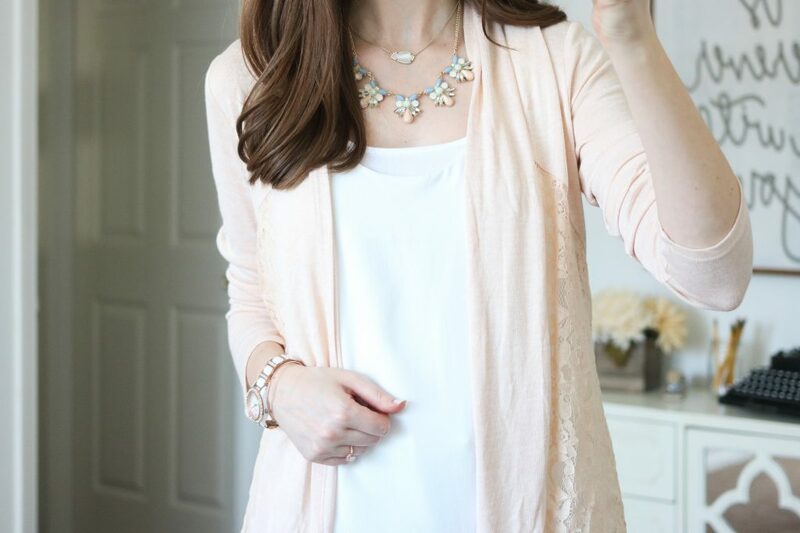 Love the cardigan! Great choice! I also loved the Ellie top too, super cute! Thanks Kristin! I pretty much love that cardigan! You got some cute items! I’m so glad you kept the cardigan, it looks great on you! I had a few fit issues with my last fix too and was bummed to have to return a couple tops that I loved. Thanks Kristen! It’s always hard when something is so close to being perfect, but the fit just isn’t right. Fortunately, most of what I get is often a great fit! I love the Victoria Split Back Top, and I will definitely be requesting in my next Fix. It’s adorable! I hope you get it in your next fix! Hey Maria! 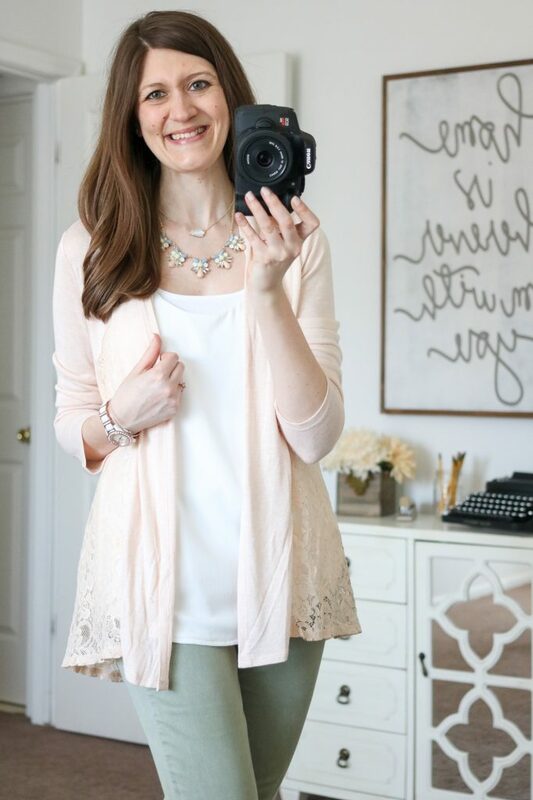 I love the outfit you made with the cardigan, shell tank, and green pants! 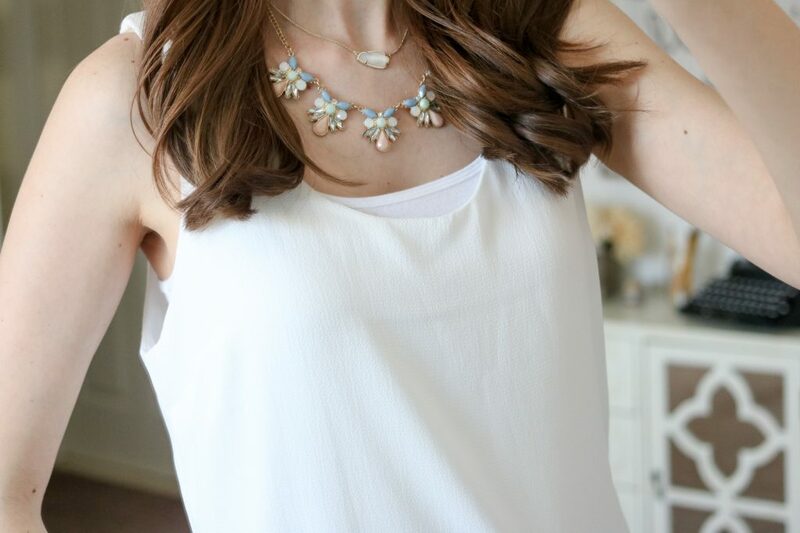 And that necklace is perfect for that outfit– it really drew all the colors together! I also thought the pink geometric-print top looked SO great on you! It would have be hard for me to let go, but arm holes are something I have a problem with too, so definitely understand!! Great fix, and thanks for hosting this link up again!!! Thank you Colleen! I agree that the colors with the cardigan, necklace, and green pants were PERFECT. And I’m glad you could empathize about the geometric top. Thanks so much for linking up! Loved the color of the Hudson top on you! It really made your complexion glow. Thank you! I agree that it was a lovely color. It was a shame about those sleeves! Hello! Your Stitch Fix posts were the final push I needed to go ahead and try them. My first fix arrives at the end of this week! I know a lot of work must go into those posts but thank you so much for doing them. 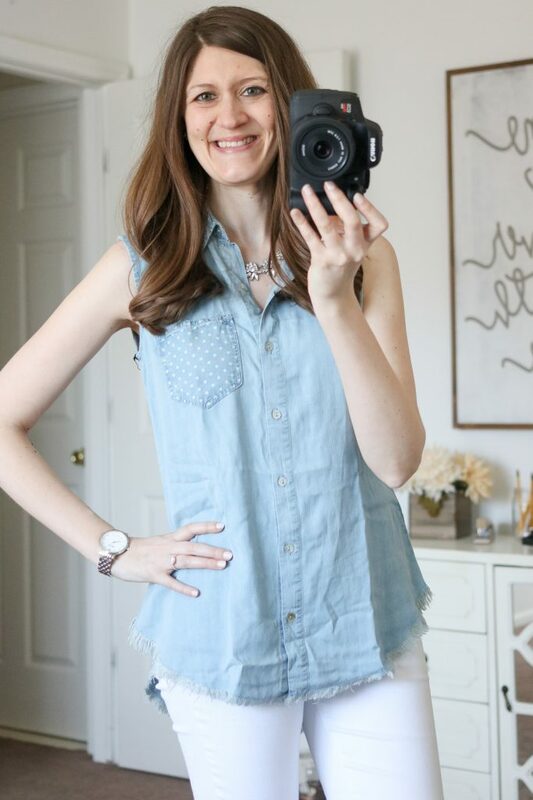 The elephant top is my favorite – so cute! Hi Jill! I’m so excited for your first fix to arrive in the mail. I will cross my fingers and hope that it’s a good one. 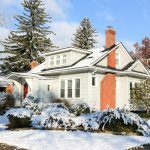 The Stitch Fix posts are a lot of work, but they’re my favorite posts that we share on the blog. I’m thrilled hear that you enjoy reading them as much as I enjoy writing them. It never occurred to me to try an XS. that’s a really great suggestion! I just have to say that cardigan is gorgeous on you! I think I need one now. ? Thank you for sharing! oh I really like everything in your box, esp the cardigan and the elephant top. That cardigan is just lovely. 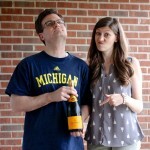 A nerd and a perfectionist fall in love. 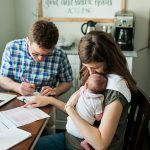 Rob's a self-proclaimed nerd, Maria is a fashion-conscious stay at home mama, and little Dessa makes us a family of three. We are so glad you stopped by. Grab a coffee and stay a while. We have a lot to share. 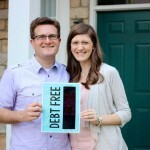 We are Finally Debt Free! Read our legal disclosures here. Crazy Together is a participant in the Amazon Services LLC Associates Program, an affiliate advertising program designed to provide a means for sites to earn advertising fees by advertising and linking to amazon.com.